Pretend it’s actually winter in San Diego Look out people, there’s a new outdoor ice-skating rink in town. This holiday season Liberty Station will have a Fantasy on Ice skating rink all December long. Lace up your skates and fulfill your Gordon Bombay aspirations from 10am-10pm all the way through January 3rd. Pretend it’s actually winter in San Diego Liberty Station Look out people, there’s a new outdoor ice-skating rink in town. This holiday season Liberty Station will have a Fantasy on Ice skating rink all December long. Lace up your skates and fulfill your Gordon Bombay aspirations from 10am-10pm all the way through January 3rd. Keep pretending it’s winter, but by the beach For the 11th year in a row you can pretend you live somewhere with actual seasons and go ice skating outdoors in Coronado. The Hotel del Coronado has its ice-skating rink set up by the beach through January 7th. While you’re there, check out DELights on display from 4-9:30pm, starting December 12th. Keep pretending it’s winter, but by the beach Hotel del Coronado For the 11th year in a row you can pretend you live somewhere with actual seasons and go ice skating outdoors in Coronado. 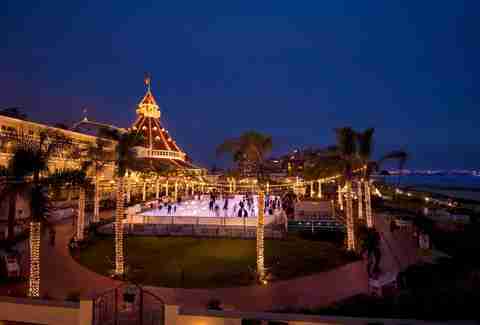 The Hotel del Coronado has its ice-skating rink set up by the beach through January 7th. While you’re there, check out DELights on display from 4-9:30pm, starting December 12th. Booze it up in the backroom with AleSmith Barons Market is hosting a Ho-Ho-Hoppy Holidays Backroom Beer Pairing with AleSmith from 6-8pm. Five bites like sliders with Brie, caramelized onions, and two types of mustard will be paired with different AleSmith brews. Proceeds from ticket sales benefit the San Diego Food Bank. Booze it up in the backroom with AleSmith Barons Market Point Loma Barons Market is hosting a Ho-Ho-Hoppy Holidays Backroom Beer Pairing with AleSmith from 6-8pm. Five bites like sliders with Brie, caramelized onions, and two types of mustard will be paired with different AleSmith brews. Proceeds from ticket sales benefit the San Diego Food Bank. Get festive in Balboa Park The 38th annual Balboa Park December Nights celebration is happening throughout the park on December 4th from 3-11pm and December 5th from noon-11pm. Participating museums in Balboa Park will be free to the public from from 5-9pm and there will be food, music, and entertainment from around the world all over the park. 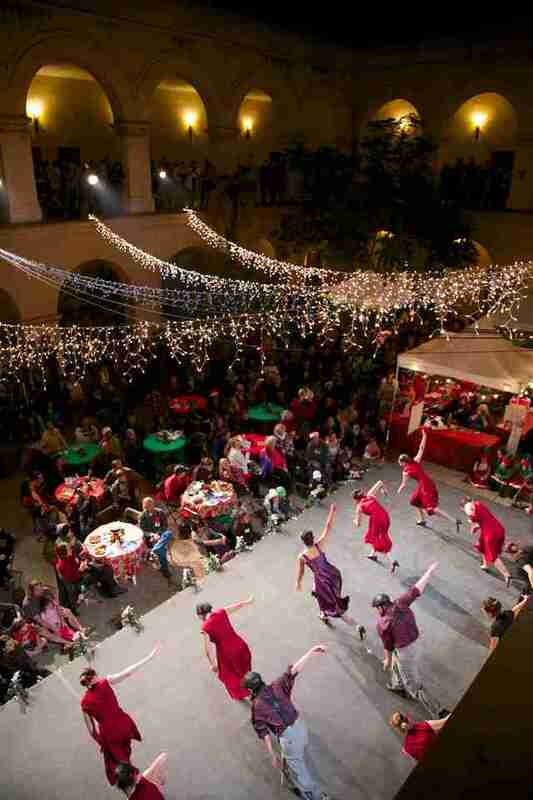 Get festive in Balboa Park Balboa Park The 38th annual Balboa Park December Nights celebration is happening throughout the park on December 4th from 3-11pm and December 5th from noon-11pm. Participating museums in Balboa Park will be free to the public from from 5-9pm and there will be food, music, and entertainment from around the world all over the park. Drink until it’s funny Sip on Green Flash beers along with four comedians and a brewmaster at Cellar 3 from 7-9pm. Performers from Finest City Improv will taste, evaluate, and elaborate on four beers while the brewmaster lays down some real knowledge about the brews. You can also get full pours from the tasting room along with food from Green Flash Bistro during the event. Drink until it’s funny Cellar 3 Sip on Green Flash beers along with four comedians and a brewmaster at Cellar 3 from 7-9pm. Performers from Finest City Improv will taste, evaluate, and elaborate on four beers while the brewmaster lays down some real knowledge about the brews. You can also get full pours from the tasting room along with food from Green Flash Bistro during the event. 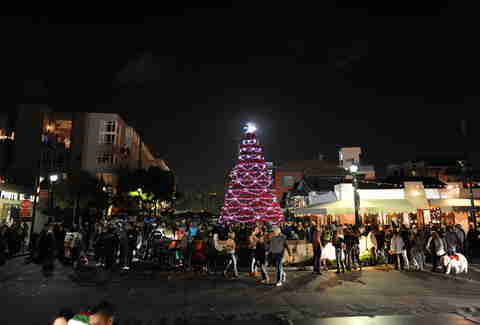 See 1,000 poinsettias turned into a tree Little Italy will hold its official 15th annual Christmas tree lighting in Piazza Basilone on Fir between Columbia and Kettner. Kris Kringle himself will be making an appearance at 4pm then at 5:30 they’ll light the 25ft tree made of more than 1,000 poinsettias. See 1,000 poinsettias turned into a tree Piazza Basilone Little Italy will hold its official 15th annual Christmas tree lighting in Piazza Basilone on Fir between Columbia and Kettner. Kris Kringle himself will be making an appearance at 4pm then at 5:30 they’ll light the 25ft tree made of more than 1,000 poinsettias. 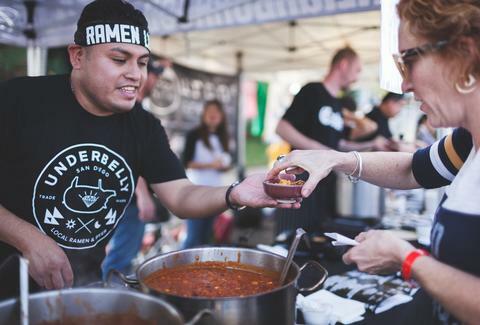 Eat 10 bowls of chili From 11am-5pm the sixth annual SoNo Chili Cook-Off street fest will feature 40 local restaurants competing to create the best chili in San Diego. Entrants include restaurants like Blind Burro, Carnitas' Snack Shack, and Soda & Swine. For just $20 you can sample chili from your choice from restaurants, or for $35 you can go for 10 chili tastings. Either way, you get a handcrafted ceramic bowl. Local brews and wines will also be on hand, plus live music and food trucks in case the chili isn’t enough. 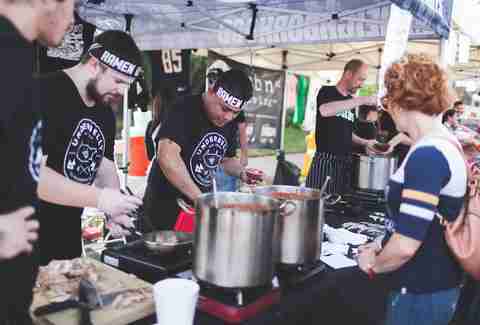 Eat 10 bowls of chili 32nd and Thorn From 11am-5pm the sixth annual SoNo Chili Cook-Off street fest will feature 40 local restaurants competing to create the best chili in San Diego. Entrants include restaurants like Blind Burro, Carnitas' Snack Shack, and Soda & Swine. For just $20 you can sample chili from your choice from restaurants, or for $35 you can go for 10 chili tastings. Either way, you get a handcrafted ceramic bowl. Local brews and wines will also be on hand, plus live music and food trucks in case the chili isn’t enough. Go to Sunday school without the guilt Bankers Hill Bar & Restaurant hosts "Sunday school tastings" one Sunday a month where you can enjoy tastings and pairings while learning about different wines or beers. December’s event will be "Don’t Call It Champagne: Celebrating Bubbly Diversity" with sommelier Molly Brooks-Thornton. Call to reserve your spot. Go to Sunday school without the guilt Bankers Hill Bar & Restaurant Bankers Hill Bar & Restaurant hosts "Sunday school tastings" one Sunday a month where you can enjoy tastings and pairings while learning about different wines or beers. December’s event will be "Don’t Call It Champagne: Celebrating Bubbly Diversity" with sommelier Molly Brooks-Thornton. Call to reserve your spot. Pretend you’re in a Bing Crosby movie Get in the holiday spirit while taking in the ocean views during A Very Merry Jazz Supper Club at Cusp. 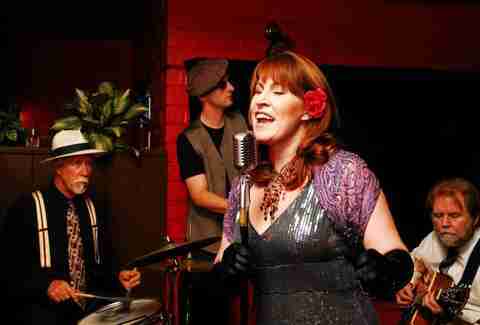 The Amelia Browning Quartet will be performing holiday classics while guests sip on cider, mulled wine, and other holiday drinks. Reservations begin at 5pm and music starts at 6:30pm. Pretend you’re in a Bing Crosby movie Cusp Get in the holiday spirit while taking in the ocean views during A Very Merry Jazz Supper Club at Cusp. The Amelia Browning Quartet will be performing holiday classics while guests sip on cider, mulled wine, and other holiday drinks. Reservations begin at 5pm and music starts at 6:30pm. Ring in 2016 The year 2015 is winding down and what better way to start a new year than with VAVi at the Catamaran Resort. There will be four rooms with DJs to keep you dancing all night long, or at least from 8pm-1:30am. Tickets are all-inclusive (unlimited beverages and appetizers until 11:30pm). Get the VIP upgrade and you can hop aboard the party boat to cruise around Mission Bay with DJs and a full casino on board. Ring in 2016 Catamaran Resort The year 2015 is winding down and what better way to start a new year than with VAVi at the Catamaran Resort. There will be four rooms with DJs to keep you dancing all night long, or at least from 8pm-1:30am. Tickets are all-inclusive (unlimited beverages and appetizers until 11:30pm). Get the VIP upgrade and you can hop aboard the party boat to cruise around Mission Bay with DJs and a full casino on board. Wait, VAVi’s having two parties? If the Catamaran isn’t your scene, then ring in the new year on the water. Nothing says 2016 like a yacht party aboard at $25 million boat that’s almost the size of a football field. The yacht will have three levels of music, 12 bars serving unlimited drinks, and passed apps, not to mention a 360-degree view of San Diego harbor from 8pm-1am. Wait, VAVi’s having two parties? Grape St Pier If the Catamaran isn’t your scene, then ring in the new year on the water. Nothing says 2016 like a yacht party aboard at $25 million boat that’s almost the size of a football field. The yacht will have three levels of music, 12 bars serving unlimited drinks, and passed apps, not to mention a 360-degree view of San Diego harbor from 8pm-1am.